The variety of handwriting styles reflect the customs, positions, and resources of each religious house which signed the roll. The impressive writing of this section (tituli 24-29) indicate the high status of houses in and around London. The first titulus is that of St Peter's, Westminster. 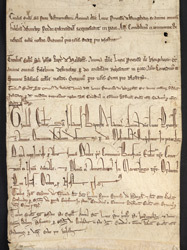 The tall, formal writing in the middle is the type of writing used for charters.